Farzana Doctor's Fascinating and Engaging First Novel. STEALING NASREEN is a novel about the lives of three very different people, all of whom belong to the same small religious community. Set in Toronto with back story in Mumbai, Nasreen Bastawala, an Indo-Canadian lesbian and burnt-out psychologist, becomes enmeshed in the lives of Shaffiq and Salma Paperwala, new immigrants from Mumbai. While working in the same Toronto hospital as Nasreen, Shaffiq develops a persistent and confusing fascination with Nasreen, causing him to bring home and hide things he "finds" in her office. Salma, his wife, discovers some of these hidden treasures and suspects that something is amiss. Unbeknownst to Shaffiq, Nasreen begins attending weekly Gujarati classes taught by Salma, who finds herself inexplicably attracted to her student. This attraction harkens back memories and regrets Salma holds about a lesbian affair that ended badly years ago. Without knowing that it is happening, Nasreen becomes the centre of Shaffiq and Salma's lives. Each keeps a secret about Nasreen, and in so doing risks their marriage, while Nasreen struggles to come to terms with her mother's death, her recent break-up, and her new relationship with her father. An impulsive kiss between Salma and Nasreen sets off a surprising course of events. DISTRIBUTION in the US and Canada. Also available through Rupa in India. NOW AVAILABLE AS AN E-BOOK! Check your online booksellers. You can find COPIES at local booksellers and libraries. Try the independent bookstores first! If they don't have a copy, have them order it in. Also available online through Amazon. 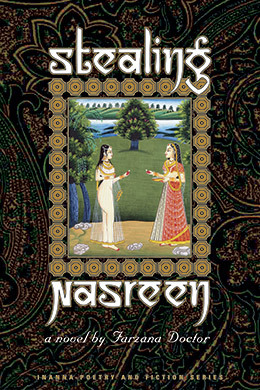 TEACHERS AND ACADEMICS: Stealing Nasreen has been used as a course text by a number of disciplines, including Women's Studies, Social Work, Sociology, Religious Studies and English. If you are interested in using my books as course texts, contact the publishers for a review copy. I may be available to come speak to your class. Stealing Nasreen has a GLOSSARY.